1 Tuner + 1 or more non-Tuner monsters..
During your opponent's Main Phase you can send this card from your hand to the Graveyard to select 1 face-up Effect Monster your opponent controls. Negate the effect(s) of that monster until the End P..
During your opponent's turn when your opponent activates a card or effect that would inflict damage you can remove from play this card in your Graveyard to change that effect so it increases Life Poin..
During your Main Phase, if your opponent controls a face-up monster with higher ATK than the ATK of this card, you can destroy this card on the field. During your Standby Phase, if this card was destr.. This card cannot be Normal Summoned or Set. This card can only be Special Summoned by sending 1 Beast-Type monster from your hand to the Graveyard. When this card is Special Summoned this way, you can.. When this face-up Defense Position card is selected as an attack target, you can remove from play 1 monster you control other than this card to remove this card from play. The attacking monster must a.. This card cannot be Normal Summoned or Set. This card can only be Special Summoned by removing from play 1 Spell Card from your hand. 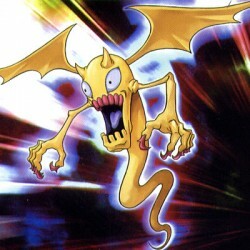 When you Synchro Summon using this card and a Beast-Type Tuner mon.. This card cannot be Normal Summoned or Set. This card can only be Special Summoned if your opponent controls a monster(s) and you control a face-up Tuner monster(s). When this card is Special Summoned..
You can remove from play this face-up card and 1 face-up monster you control to select 1 Synchro Monster in your Graveyard with a Level lower than or equal to the combined original Levels of the other..